Filmmaker: Archie Stewart. Transfer Note: Three sequences copied at 24 frames per second from a 16mm print preserved by Northeast Historic Film. Running Time: 4 minutes. In 1934, five years after Hollywood converted widely to sound, RCA introduced a 16mm sound camera for amateurs. (Synchronized sound was recorded optically on the edge of the film.) If we think of “home movies” as silent, that is because most amateurs continued only to shoot silent footage for the next fifty years, until video replaced film in the home market. Archie Stewart (1902–98), a pioneering adopter of new technology, provides us with fascinating glimpses into the sights—and sounds—of family life in the 1930s. Stewart was a New York car dealer who had been shooting 16mm film since 1926. He obtained a sound camera around Christmas 1935 to document family events, outings with friends, and characters in Maine, where he had a second home. He was an active member of the Amateur Cinema League and in 1937 published one of the first articles on amateur sound, “A Talkie Movie Maker Speaks,” in the league’s magazine, Movie Makers. That year the league had 250 chapters, and the New York Times estimated that the country had a hundred thousand home-movie makers. Stewart continued making films until 1993, long after most amateurs had switched to video, and his collection at Northeast Historic Film runs to almost seventy thousand feet of 16mm film. 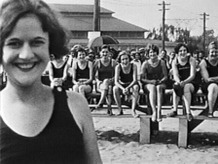 Films by Archie Stewart and several other early amateur filmmakers were preserved in 1999 by Northeast Historic Film through Treasures of American Film Archives funding. Amateur Movie Making: Aesthetics of the Everyday in New England Film, 1915-1960, edited by Martha McNamara and Karan Sheldon (2017), Patricia Zimmermann’s Reel Families: A Social History of Amateur Film (1995), and Alan Kattelle’s Home Movies: A History of the American Industry, 1897-1979 (2000) survey home moviemaking from different vantage points. Available on DVD is Living Room Cinema: Films from Home Movie Day, Vol. 1 (2007), published by the Center for Home Movies, the organization that founded Home Movie Day, an international celebration of home moviemaking started in 2002.